With your donation, you will improve living conditions, self-determination and the future! Empower women and the village entrepreneurship of Guabuliga by donating money for their micro-business ideas. Enable high-quality education by supporting teachers and appropriate school facilities or sharing awareness-raising workshops with other villages. BRAVEAURORA and Guabuliga are happy about your donation – because every step counts! For BRAVEAURORA transparency is very important. Therefore the bank accounts for donations and administrative costs are strictly separated. All donations arrive 1:1 to our project in the north of Ghana. Donations which will go 100 % to the children and the village! On this account only donations with explicit purpose of administrative costs of the donators will go there. Administrative costs will exclusively be used for needed office material, association stock and travel expenses. In these cases BRAVEAURORA always considers to take the cheapest version and possibility. You too should benefit from your donation. Donations to BRAVEAURORA are tax deductible. That means you can donate more without spending more! An automatic service for donors exists since 01.01.2017. 1. Donate any amount to BRAVEAURORA. 3. If your data is correct, all your annual donations will be reported automatically to the tax office. BRAVEAURORA has been on the list of charitable organizations since 2013. This means that we get reviewed annually. This is how we ensure transparency to our donors and certainty, that donations will be used for specific purposes. In Switzerland, BRAVEAURORA is registered as a non-profit association and is a tax-exempt institution. Accordingly, BRAVEAURORA is also listed in the list of tax-exempt institutions of the canton of Zurich. Organizations which are awarded with the cachet for donations fulfill objective and testable standards at the application and administration of your donations. These standards are controlled by independent auditors through strict verifications once a year. A maximum of donation security, improvement of quality in the donation administration, obligation of transparency or flexibility and current improvement at the application are only a few of the many goals and principles which are important to the initiators and responsible organizations of the cachet for donations. You can trust on a transparent and efficient use of your donation referred to your dedication! 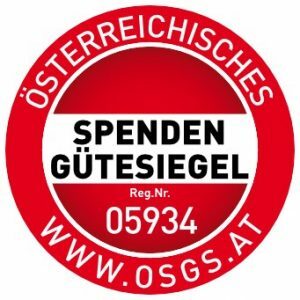 Here you can see the entry at the website of th Austrian cachet for donations (OSGS). A special occasion is approaching – maybe a birthday or a Christmas party? Or have you seen or read a report on the orphanage and volunteer tourism business and want to do your part to counteract it? In any case, no matter whether online, by way of order or donation box, start your donation campaign for BRAVEAURORA! We gladly support you. Donating as a company offers several benefits: you can do something good, sustainably change inequalities and, in addition, benefit as a company by committing yourself to social commitment with your corporate strategy! There are many ways to support BRAVEAURORA. You can finance an upcoming project, donate an amount of your choice to the association and the local people, organize a staff collection, initiate a customer campaign for a specific period or BRAVEAURORA at events or occasions in the form of gifts (eg educational sponsorships for Christmas), donation boxes or something similar. Whether for your employees or your business partners, choose a sponsorship for one of our projects as a different and valuable gift! BRAVEAURORA is pleased to cooperate with schools. From experience we know how motivated students are and what a joy it can be to help the less privileged. Charity runs, cake buffets or special projects for the benefit of BRAVEAURORA projects in the context of an A-Level thesis are only examples. Students have the possibility to gain interesting insights into the sustainable development cooperation and additionally benefit children and their families in Ghana! We also like to combine these school activities with a personal visit and a presentation on sustainable development cooperation, life and challenges in Ghana. Through this, awareness of the need to fight against the orphanage business and volunteer tourism will be raised.